The Client is a leading service provider in Real Estate Domain. The Client intents to develop a Real Estate website which is a professional real estate site that will serve as a central hub for institutional real estate ("RE") operators, developers and transactions. The site will facilitate cross-border RE investments while supporting the Company's global and personal brokerage network. The site should be designed as a functional, practical and user-friendly site that can be used also by non-savvy RE executives. There should be minimal number of guided user processes in the site, which are simple and intuitive. STPL has proven track record of delivering successful IT solutions for our clients the business of Real Estate. The Exchange consists of (i) a central (physical) trading floor that connects all brokers worldwide, (ii) the online marketplace, and (iii) transaction support facilities. Brokers are responsible for establishing, developing, and maintaining professional relationships with relevant RE operators, companies and service providers. Brokers will also serve as transaction initiators and promoters, contributing to successful completion of cross-border RE transactions to the benefit of al interested parties. Messaging other users and more. The site will serve different types of RE stakeholders, including public and private RE companies, RE developers, entrepreneurs, institutional RE investors, financing companies, service providers and others. Account registration will be required from all users who wish to have their properties, or profiles, listed on the site. The registration process itself is quick and simple, while requesting for basic account data, business information and deal preferences. The entire process is designed to take no more than a few minutes. The registration process will be a five steps process and users must complete the steps required to finish the registration process. 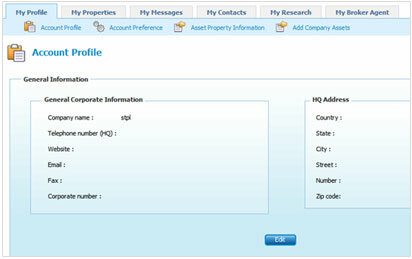 The site will include a comprehensive database of accounts and properties with pre-defined data fields. Users will be able to upload their portfolio properties in their account profile. Post Property will be a seven step process. Search supports both basic and advanced search capabilities based on user preferences. 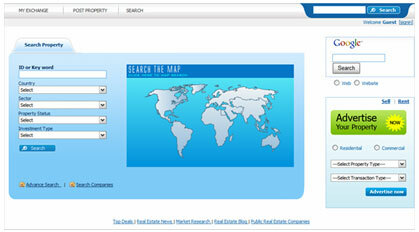 Search fields may include property location, sector, status, investment type, etc.